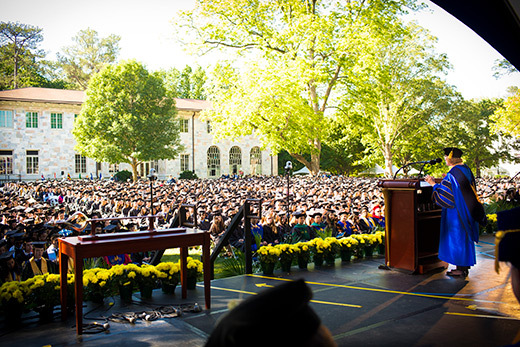 Emory's 172nd Commencement, held May 8 on the Quadrangle, was steeped in time-honored tradition, from the grand academic procession to the collective conferral of degrees. A time of growth, change and achievement was celebrated Monday morning at Emory’s 172nd Commencement, which featured a keynote address by former U.S. Poet Laureate Natasha Trethewey, one of the foremost voices in contemporary American poetry. The Class of 2017 assembled on the Emory Quadrangle to participate in 9 a.m. exercises steeped in time-honored tradition, from the grand academic procession led by a pipe and drum band to the presentation of honorary degrees and awards and a collective conferral of degrees. A crowd of about 15,000 guests began gathering as early as 6:45 a.m. for the day of ritual and pageantry, complete with colorful academic regalia, music and the central ceremony, which were followed by diploma ceremonies for individual schools. This year’s 4,615 graduates earned a record number of degrees, marking a nearly 13 percent increase over the past five years. A total of 4,700 degrees — including 85 joint degrees — were conferred upon students from 51 U.S. states and territories and 67 foreign countries, according to final statistics from Emory’s Office of the Registrar available May 8. The oldest graduate in the Class of 2017 is 70-year-old William Shapiro, who received an MBA. The youngest is 19-year-old Rubenie Stimphil, earning a bachelor’s degree in film studies. Some 60 percent of this year’s graduates are women; 40 percent are men. Trethewey’s invitation to deliver this year’s keynote remarks was in recognition of her wide-ranging achievements as one of America’s preeminent poets. In addition to directing Emory’s acclaimed Creative Writing Program, Trethewey, the Robert W. Woodruff Professor of English and Creative Writing, served two terms as the 19th Poet Laureate of the United States (2012-2014) and was also named Poet Laureate of the State of Mississippi (2012). She has received a range of prestigious awards and fellowships for her writing, which includes four collections of poetry, a chapbook and a book of creative nonfiction. In 2013 she was inducted into the American Academy of Arts and Sciences; she was awarded the Academy of American Poets Fellowship for distinguished poetic achievement in 2016. During Monday’s ceremony, Trethewey received an honorary Doctor of Letters degree — among a series of special awards and recognitions presented to students and faculty. Sarah Blaffer Hrdy, an American anthropologist and primatologist and professor emerita at the University of California, Davis. She is the author of five books including “The Langurs of Abu: Female and Male Strategies of Reproduction” (1977), the first book to examine the reproductive strategies of nonhuman primates from the perspective of both sexes; “The Woman That Never Evolved” (1981, new edition 1999), selected by the New York Times as one of the Notable Books of the Year; and “Mother Nature: A History of Mothers, Infants and Natural Selection” (1999), chosen by Publisher’s Weekly as one of the Best Books of 1999. Claes Tingvall, a Swedish epidemiologist specializing in injury epidemiology, safety rating and safety management. At the Swedish Transport Administration, he had a leading role in developing the policy of Vision Zero, a road transport system free of death and serious injury resulting from road crashes.